Mumbai, also known as Bombay, the official name until 1995 is the capital city of the Indian state of Maharashtra. As of 2011 it is the most populous city in India with an estimated city proper population of 12.4 million. The larger Mumbai Metropolitan Region is the second most populous metropolitan area in India, with a population of 21.3 million as of 2016. Mumbai lies on the Konkan coast on the west coast of India and has a deep natural harbour. In 2008, Mumbai was named an alpha world city. It is also the wealthiest city in India, and has the highest number of millionaires and billionaires among all cities in India. Mumbai is home to three UNESCO World Heritage Sites: The Elephanta Caves, Chhatrapati Shivaji Maharaj Terminus, and the city's distinctive ensemble of Victorian and Art Deco buildings. Experience the sights and sounds of the city that never sleeps. Mumbai is greatly known as the city that never sleeps. As the scorching sun sets for the day, citizens from all walks of life head out to enjoy the cooler temperature. Marine Drive and other places in close proximity to the sea like Chowpatty are crowded with Mumbaikars enjoying the cool breeze and joyous sunset. 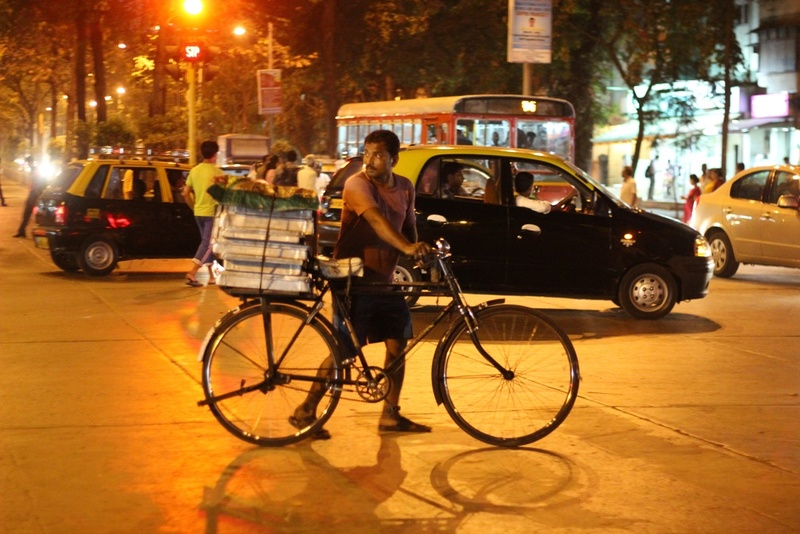 In this night tour, you get to the experience the other side of Mumbai. The nightlife out here is never ending. There is always something fun to do or something serene to experience. The Banganga Tank, Jain Temple, the chaotic CST station, and the vibrant shades of cynical sexualism through Mumbai's notorious red light district. Experience the incredible diversity between modern, cosmopolitan and the traditional India. Private Tour: 7,500/- Rupees.You can bring a maximum of five people on your private tour. CHOWPATTY BEACH: Vibrantly lit up till the wee hours of the morning, Chowpatty beach at night is packed one. Friends and families enjoy drinking juices, licking ice creams and eating Indian snacks. BANGANGA TANK: The water from this famous tank is believed to have special healing powers. Originally built in 1127 the Banganga is surrounded by Hindu temples. Rumor has that its spring comes from the holy Ganges River. JAIN TEMPLE: This intricately-decorated temple is a big tourist attraction because of its vibrancy in colour and its beauty in architecture. The temple signifies peacefulness and non-violence, just like the religion Jainism for which it has been built. KAMALA NEHRU PARK: Malabar Hill is the home of the aristocrats of Mumbai and Kamala Nehru Park is at the heart of it. This park is filled with greenery and creates a peaceful vibe everything you visit it. KAMATHIPURA (RED LIGHT AREA): An area well known but rarely talked about, the Kamathipura district is a land harbouring a torrid affair between man and his sexual desires. Prostitution out in the open, and families torn and broken; these lanes speak of stories with distorted realities and unfavourable outcomes. Witness this reality within the frameworks of your car is strongly advised! CST STATION: One of the busiest railway stations in the country, Chatrapathi Shivaji Terminus is a beautifully designed station of British architecture. It is also the same station that was under 24/11 Terrorist attacks in 2008. The award-winning movie "Slumdog Millionaire" was also shot here. This grand site is gloriously lit up in the evening and you will enjoy this view at the end of the tour.